At Dexclusive, online at Dexclusive.com, you can find luxury jewelry and accessories at discount prices. Dexclusive sells watches by designers including: Adidas, Puma, Rolex, Dolce & Gabbana, Gucci, Invicta, Chanel, Dior, and DKNY. Dexclusive also carries sunglasses by Christian Dior, Guess, Marc Jacobs, Ray Ban, and Maui Jim. There is also designer jewelry at Dexclusive including rings, earrings, and bracelets by Bvlgari, Dolce & Gabbana, and Invicta. RetailSteal.com has the best Dexclusive coupons, Dexclusive discounts, Dexclusive coupon codes, and Dexclusive promo codes. Shipping and handling rates at Dexclusive depend on the pricing of your purchase and your shipping destination. Free shipping is offered for orders over $100. See website for full details. Exclusions may apply. Get $100 off your online order of $3,000 using the coupon code at Dexclusive. Click link to save. Save $500 on any $5,000 purchase with the coupon code online at Dexclusive. Click link for savings. Save $90 using the coupon code on any purchase of $2,500 or more online at Dexclusive. Click link to save. 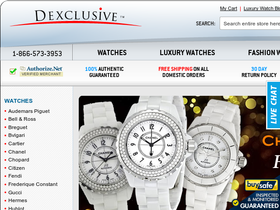 Use the coupon code and get an extra $50 off Technomarine watches online at Dexclusive. Click link to purchase. With the coupon code at Dexclusive get $25 off your online order of $500. Click link to save. Take $10 off your online order at Dexclusive when you spend $300 and use the coupon code. Click link to shop. Save up to 75% on designer jewelry and accessories online at Dexclusive. Click link to buy. Save up to 72% on Puma watches at Dexclusive. Click link to shop online. Take 51% off your online order of Bulova watches at Dexclusive. Click link to buy. Save 41% on your online order of Gucci watches at Dexclusive. Click link to purchase. Get up to 40% off Armani watches when shopping online at Dexclusive. Click link to save. Spend $100 or more and get free shipping online at Dexclusive. Click link for savings.